If you plan on visiting our beautiful Delaware beach towns this Spring/Summer, you may notice a few unavoidable disruptions at the beach, as the much awaited Delaware Beach Replenishment program begins. Part of the coastal storm risk management project to reduce storm damage to infrastructure, it will also include re-nourishment and enhancement of the beaches at Bethany, South Bethany and Fenwick Island. Unfortunately, due to previous scheduling and equipment issues, the work is now scheduled to begin mid-May and complete by late July, (if all goes accordingly to plan). This is a federal project headed by the U.S. Army Corps of Engineers Philadelphia District, who contracted ‘Great Lakes Dredge & Dock Company’ to take on the mammoth task. The last time such a project took place in the area was back in 2013. 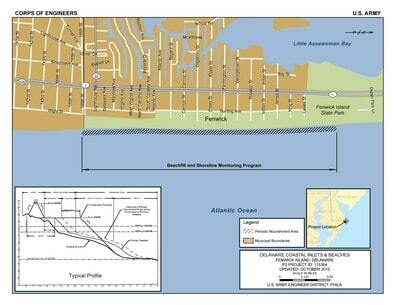 What’s Involved in the Beach Replenishment Program? 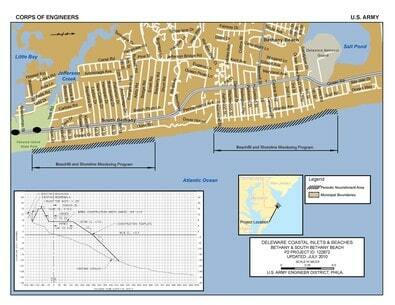 Work will involve dredging sand from approved borrow areas. The sand will be pumped through a series of pipes onto the beaches. The sand will then graded into a dune and berm template designed to reduce potential storm damage to infrastructure, businesses, and homes. Pipe & other construction equipment will be mobilized to staging areas prior to dredging and beach-fill operations. Visitors and residence should note that during the replenishment project, stretches of the beach will be closed – approximately 1,000 feet at a time, according to the Army Corps of Engineers – though the surrounding beaches will be accessible. When is the Beach Replenishment Scheduled? Replenishment work is expected to begin around mid-May and be completed by mid-June. Replenishment work is expected to begin around mid-June and be complete by mid-July. Replenishment work is expected to begin around early-July and be completed mid- to late-July.